This coffee maker is good for work. I have it in an office I share with two coworkers and it's enough for just us. The price is right if you are looking for somethung cheap without bells and whistles. We use paper filters so it's easier to clean. It doesn't come with a mesh filter like more expensive pots do but you can buy one. It's easy to clean and small enough to store when not in use. It might be good for a dorm or a first apartment. There are many reasons I wouldn't buy this for home use now. the design isn't sleek. I prefer the square look to coffe makers; however, this does usually mean it takes up more space. Also, it doesn't have a timer. If you want to make a certain amount of coffee you need to measure it for yourself. This is also not good for so,done entertaining as it does not make enough coffee for a party. I will say it has held up and its very easy to figure out how to use it. I have cleaned it by running water and vinegar through it and flushing it out a few times. I love Mr Coffee products, they do what they are supposed to do and last a long time. This is my second Mr Coffee and the 4 cup size is nice. I like the reusable filter basket that comes with it, no more messy paper filters. Easy to use, easy to clean and the coffee always tastes good. I purchased this coffee maker a few weeks ago and am quite satisfied with it. I opted for this model rather than the programmable because I decided I'd end up forgetting to prep it the night before and that making coffee in the morning is a relaxing part of our normal routine. The main reason for this purchase was to have a small amount of coffee on hand that I could drink throughout the morning/afternoon, and only have to make it once, compared to our other coffee machine with the disposable cups. (We were using a plastic reusable filter cup for it and it was very tedious to clean each time.) With this little machine you get 5 cups of coffee if you fill the reservoir up to the max line (you can't overfill it, there's a drain hole). They say 4 cups because it's 5 cups all the way to the top of the carafe. It pours easily without dripping and is small enough to easily lift when full. Cleaning the pot is a breeze and the footprint on the whole piece is nice and small at about 9 1/2" tall, 5 1/2" wide and about 7" deep with the handle sticking out. I'm not a big coffee drinker so the amount of coffee is perfect. I also pour it into a pitcher to make iced coffee and store that in the fridge. The best tip I can give you is that you can use paper filters in this if you prefer them over the reusable filter. An off-brand 10-12 cup filter (flat bottom, not cone) fits just fine and is easier to find than the smaller sizes. Now, a few negatives. I can't leave the coffee warming for more than 3 hours or so as it gets a burnt, off-taste. At least it did for me with a dark French roast. The plastic hinged lid on the top of the machine is difficult to close and I usually struggle with it for a few seconds before it snaps down. Not the end of the world, just a minor annoyance. And, it takes a long time to make a full pot of coffee, but, you can remove the carafe to fill your cup before it finishes. 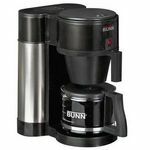 Nice little coffee maker all in all; does what it says it does and I am satisfied. 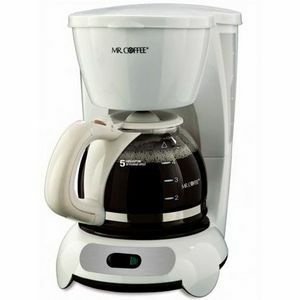 The Mr. Coffee 5-Cup Coffee Maker TF6 is a good coffee maker. 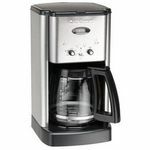 The Mr. Coffee 5-Cup Coffee Maker TF6 is a reasonably priced good-quality coffee maker. I also purchased mine at Wal Mart. 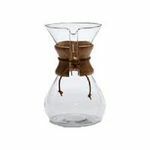 I had intentions of purchasing a replacement decanter, but there were none in the size I wanted so I ended up purchasing this coffee maker. 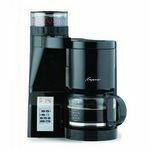 My previous coffee makers have been Mr. Coffee brand which have provided many years of service. This coffee maker does come with a permanent filter which I occasionally use. It gets messy when disposing of the used coffee grounds. I end up using the disposable paper filters sometimes so I can just dump the used filter in the trash. This coffee maker is the perfect size for me since I am only making the coffee for me. I can drink the whole pot by myself! Any coffee maker bigger than this size seems to be a waste. 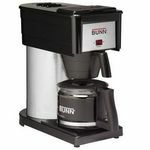 The newer single cup coffee makers are too small and more expensive, and the coffee for those coffee makers are too expensive. I got this little Mr. Coffee unit at Wally World as a replacement for a similar one I'd had for years. I like this one slightly better. Well, so far, anyway. The jury's still out until this one lasts for years, too! What I like better is that this one has just one lid you flip up to get it set up. Pour the water in one place, put the coffee in the other, flip the lid down, turn it on, and it goes to work. It comes with one of those micro-filter baskets that makes the paper filters unnecessary, although they tell you it's also the right size for a small paper filter too, if you want to go that way. Why anybody would opt for fooling around with paper filters when you don't have to is beyond me, but, hey, to each his own, right? This thing is like all the rest of them -- when they say "cups" they mean teeny-weeny cups. So, for those of us who live in the real world, "4 cups" means "2 cups". They say you can do "5 cups", so I guess that means "2 1/2 cups" in the real world. Who defines this stuff, anyway, a bunch of little old ladies? So, anyway, if this thing will just keep doing what it does every morning for the next five years or so, it will rate as well as that Braun unit I just threw away. That one was made in Germany, this one is made in -- oh, you guessed it? -- China.